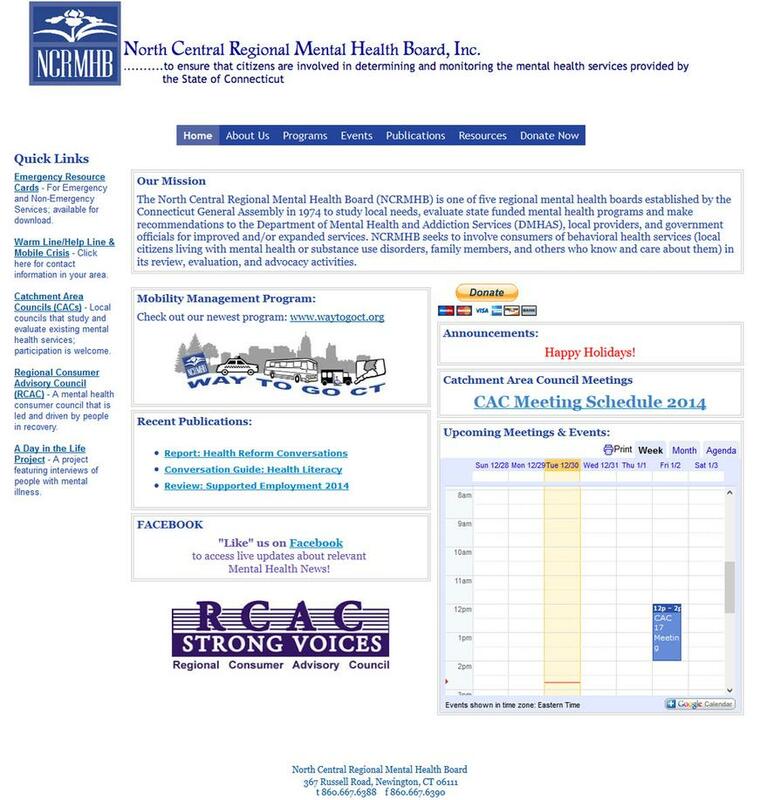 The North Central Regional Mental Health Board (NCRMHB) is one of five regional mental health boards established by the Connecticut General Assembly in 1974 to study local needs, evaluate state funded mental health programs and make recommendations to the Department of Mental Health and Addiction Services (DMHAS), local providers, and government officials for improved and/or expanded services. NCRMHB seeks to involve consumers of behavioral health services (local citizens living with mental health or substance use disorders, family members, and others who know and care about them) in its review, evaluation, and advocacy activities. CT MENTAL HEALTH REGIONS – In 1975, Connecticut decentralized its delivery of mental health services. There are five mental health regions in Connecticut. Each region is made up of catchment areas.Each catchment area has a Catchment Area Council (CAC), and each region has a Regional Mental Health Board. These advisory councils and boards were established to ensure that citizens from every town in Connecticut will be actively involved in determining and monitoring the kind of mental health services that will be provided in each catchment area by the Connecticut Department of Mental Health and Addiction Services. Please call 860-667-6388 if you would like to get involved. For additional information please visit their website at www.ncrmhb.org or call them at 860-667-6388.